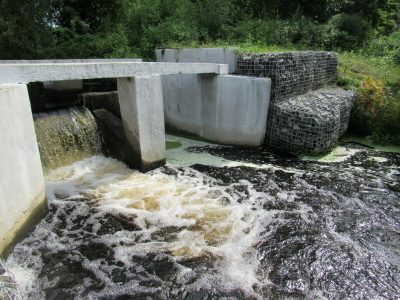 City of Vineland, Cumberland, NJ – The City owned and operated recreation impoundment, located near Delsea Drive (Route 47) and along Burnt Mill Branch of the Maurice River, is a tree-covered earthen embankment with an irregular crest elevation and a reinforced concrete spillway structure at the eastern abutment. The previous dam did not meet the spillway capacity and freeboard requirements of the NJ Department of Environmental Protection’s (NJDEP) Dam Safety & Flood Control Section (DSFC), and therefore required a hydrologic and hydraulic analysis, failure analysis, spillway design storm determination, and rehabilitation to safely pass the spillway design storm. 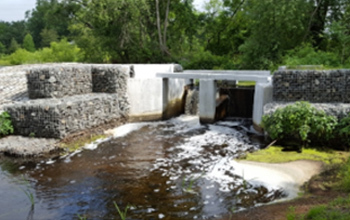 Following the partial breach of the dam after Hurricane Irene in 2011, the City of Vineland hired CES to coordinate an emergency draw-down and fish salvage, and to provide emergency inspection services. The City also hired CES in 2012 to perform the required hydrologic and hydraulic analysis, dam rehabilitation design, and to develop an Emergency Action Plan and Operation & Maintenance Manual for the dam. All calculations, EAP and O&M documents have been reviewed and approved by NJDEP. CES completed the design and CM/CI stages for rehabilitation, which will include clearing and re-grading of the earthen embankment, installation of overtopping protection, and the restoration of the existing concrete spillway.